Dizzy Gillespie. Art Blakey. Art Farmer. Count Basie. Gerry Mulligan. Thelonius Monk. Sonny Rollins. Coleman Hawkins. Hank Jones. Chubby Jackson. Scoville Browne. Felix Maxwell. Paula Morris (i). Taft Jordan Jr. Everard Powell. Buck Clayton. Lester Young. Gene Krupa. Documentary. Music. Black Interest. Feel Good. Photography. 1950s. 01 Dave B's must sees. Recommended. 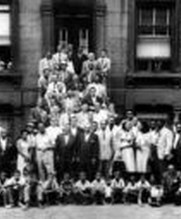 On a summer's day in 1958, fifty seven of the era's greatest jazz musicians gathered together in Harlem, New York City. The purpose - a now legendary photograph to be taken by top snapper Art Kane. This is the fascinating story of that day and the people, many of whom had never really met before, involved, with home-movie camera clips, some great musical interludes and interviews with many of the participants 35 years on. Narrated by Quincy Jones.